Wader Quest: An update from Marvellous Milly and the Wing Threads: Flight to the Tundra team. An update from Marvellous Milly and the Wing Threads: Flight to the Tundra team. 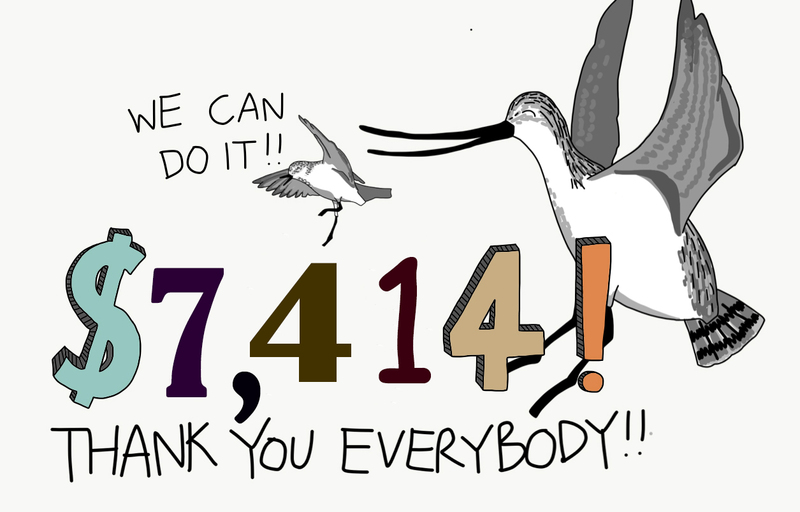 Another week of the crowdfunding campaign has flown by and we've made further progress having raised $7,414 thus far. If you are one of the amazing folks that have already donated to Wing Threads: Flight to the Tundra, I would like to say thank you, thank you, thank you! Thank you so much again. We hope you have been enjoying the videos and cartoons on Facebook and Twitter as much as we're enjoying bringing them to you! If you haven't seen all of the 'Meet the Shorebirds' cartoons, you can check them out on the Wing Threads: Flight to the Tundra website. Stay tuned for more plus new animations coming out this week. If you have been considering helping Milly and haven't got around to it yet, please do so if you can. The EAAF is not the only problem that waders face in the world, but it is surely the most critical and acute and it needs our attention now rather than soon - Wader Quest team.